If there's one thing in your pantry that should be kept under lock and key, it's your jar of Nutella, obviously. That's why a German man has created -- and patented -- a simple device that will protect your jar of the chocolatey hazelnut spread from unauthorized eaters, like your roommate who sneaks a taste or two while you're not around and thinks you don't notice. 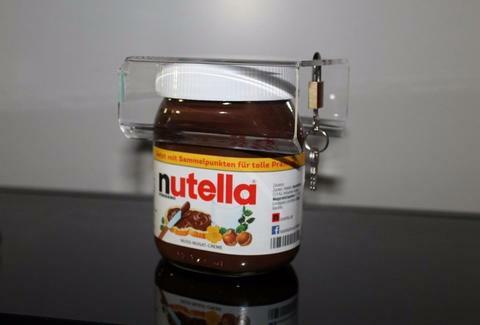 The lock won't burn off an intruders' hands with lasers or activate a wireless alarm system, but it could be one extra barrier between your hard-earned Nutella and the filthy, thieving mitts of your roommates. Unsurprisingly, there's a huge demand for the acrylic locks, which come with two keys, and are currently available on eBay for about $12, according to a report by Mashable. At this rate, they'll be available at Bed Bath & Beyond in no time. It's worth noting, the little plastic locks aren't about to keep out the more-determined mooches, so you'll have to keep up with the passive aggressive notes. Tony Merevick is Cities News Editor at Thrillist and needs a similar lock for the bourbon stash at his desk. Send news tips to news@thrillist.com and follow him on Twitter @tonymerevick.